When it comes to having secret storages for small, valuable items, the best hiding places are always in plain sight where people will never expect to look. Now, for the first time ever, we have laid our eyes upon a secret storage that is not only functional but adds class and style to your desk as well. Introducing the Gr2 Secret Storage Spheres. As a secret storage, the Gr2 Sphere will definitely surprise anyone, since it is literally hiding in plain sight. Not to mention, they are completely unique in their design. 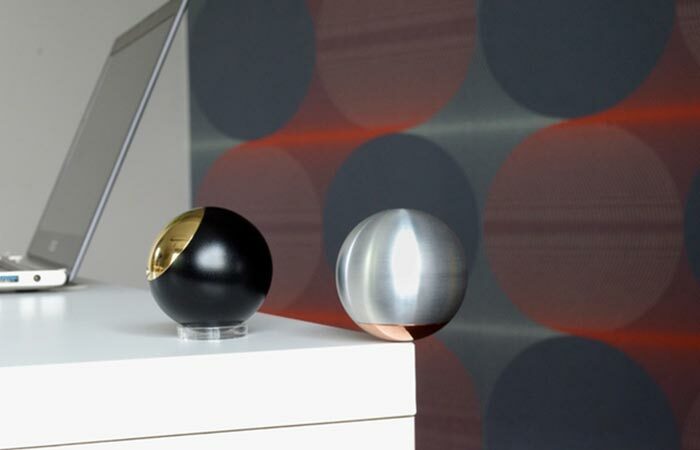 Elegantly designed, each sphere is precisely machined from a single block of anodized aluminum and brass or copper lids. The Gr2 Sphere utilizes modern design elements that have been expertly CNC machined to give it a unique elegant look. 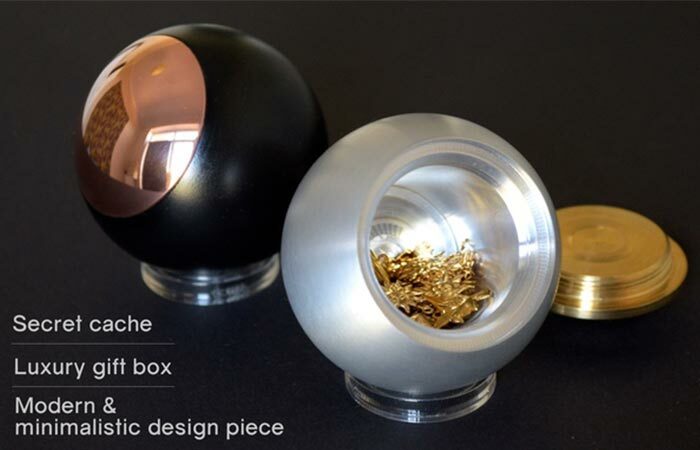 The spheres are constructed out of anodized aluminum and the lids are created from either brass or copper and have been polished to a mirror finish. Check out the Kickstarter introduction video below. Because the Gr2 spheres are precisely machined, the only one who would know that it opens, is you. You open it with the included silicone handle. The lid has been machined in such a perfect fashion that nobody will even realize that it can be screwed open. How you screw it open is also unique since the Gr2 comes with its own silicone handle that sticks to the brass or copper lid and then allows you turn it off. Each Gr2 Sphere comes with its own acrylic stand and it was engineered with a low-gravity center so that it won’t roll around. Not only can you store anything from jewelry to memory cards to herbs and even cash in it, but the Gr2 Spheres are truly functional pieces of desk art. Over time, the copper and brass lids will tarnish via the Patina process that can be seen on a daily basis; it gives it interesting colors and patterns but if you want to reset it to its original shine, a polishing kit comes included in the package and will have it as good as new in less than a minute. The Gr2 Spheres measures in at 2.13” outside diameter, 1.22” internal bore diameter and 1.18” bore length and weighs 8.50oz.